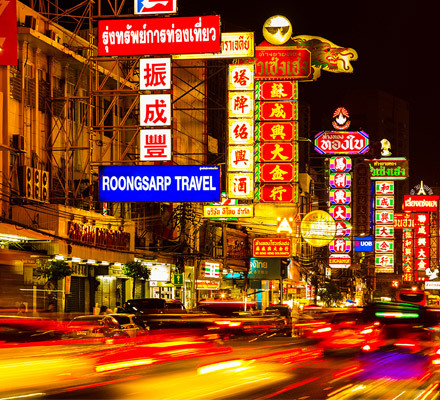 Whether visiting this vibrant city for a day or for a week, you could wander the streets of buzzing Bangkok for miles, handing out no more than a couple dozen baht to find yourself bursting at the seams with an endless supply of mouthwatering food – all served from makeshift roadside trolleys. Exploring here, any visitor will find it a challenge to locate a street corner without a row of food carts, lined up dishing out freshly made meals like noodle soup, fish cakes, chicken satay, Khanom Bueang (a coconut – stuffed rice flour crepe taco), Khao Niew Ma Muan (mango sticky rice), countless varieties of curry, and of course Pad Thai, the popular Thai-style, chewy rice noodles that come served mixed into gooey omelettes. And with prices ranging between just 10 to 100 bahts per helping (Dhs 1 to Dhs 10), these dishes most certainly guarantee your moneys worth. The culinary, backstreet adventure of Bangkok is a complete celebration of the senses. With each and every dish, ready yourself to be greeted with a fresh and fragrant ingredient like lemongrass, coconut milk, galangal or kaffir lime. Perhaps thought to be a unique combination – but nonetheless irresistibly delicious – Thai cuisine presents its diners with four prominent tastes – salty, sour, sweet and spicy (and, as a tip, saying your preference is “not spicy” to a Thai local will be taken as spicy, in standard, international terms. Be sure to insist that you don’t want your food ‘Thai spicy”, if you’re not a fan of heat). A medley of regional influence, Thai food comprises culinary components learnt from neighboring countries of Burma, Cambodia, Indonesia, and Vietnam. And what’s best? You can find it any time of day, at any point in the city. Bangkokians are known for enjoying small portions of food regularly throughout the day, meaning many find themselves tucking in at all hours of the night and morning. There’s even a midnight food tour available in the city (Bangkok’s Best Eats Midnight Food Tour, is the one I went on), Photographs which is given by tuk tuk. On this tour you explore the local favourites places a newbie tourist would never find, including the city’s best Pad Thai at an eatery called Thip Samai, where people queue alongside an open-street ‘kitchen’ of industrial barrels and the biggest woks you’ll ever see – just to grab a seat for a few minutes. Led by tour or not, the only way to enjoy Bangkok’s food scene is to allow your senses to do the talking – your nose is sure to lead the way through the bustling streets as you discover one of the world’s most exciting street food scenes. Som Tam Freshly pounded papaya salad with chilies, peanuts, garlic, tomato, fish sauce, tamarind juice and a generous squeeze of lime, topped with dried shrimp or salted crab. Gai Pad Med Mamuang Chicken stir-fried with the crunch of cashews, onions and red chilies. Pad Thai Thai-style noodles fried in a wok along with veggies, seafood or meat, bean sprouts, fennel and egg. Accompanied with fish sauce, palm sugar, chili powder and a sprinkle of ground peanuts. Oyster Omelette Crisp and crackling omelettes topped with glossy oysters. Bamee Chinese-style wheat and egg noodles, typically served with slices of barbecued pork, a handful of greens and/or wontons. Sate Grilled skewers of meat, accompanied by slightly sweet peanut-based dipping sauce. Ho Mak Pla Baskets made with banana leaves that are layered with herbs, fresh fish, red curry paste and egg, baked and topped with coconut cream. Khao Niew Ma Muan Mango with sticky rice (you’ll find streets dotted with stalls offering this deliciously addictive dessert). Khnom Bueanag A Thai crepe that resembles a taco but is made with rice flour. They are crisp and stuffed with coconut or flavoured cream and shredded coconut.